I would be lying if I said that the idea of having a perfect race isn’t one of my ultimate goals in endurance sports. We all have our own definition – whether it’s setting a PR, finishing, or otherwise, but rarely do the pieces fall into just as we’d like them to. For me, it’s about fulfilling the potential I see in myself during key workouts, training breakthroughs, or difficult situations when a clock’s not running and it ultimately doesn’t count in the record books. More concretely, I want to put the pieces together and race a triathlon where I swim, bike and run to the best of my ability. It may sound obvious, but for the triathletes out there – how many of you have nailed all three legs in the same race? How many runners have negative split their A-race? I’ve made substantial gains in swimming, biking and running since I started racing long course in 2011, but I’ve failed to link all three together to the best of my ability. Until now. As I’ve posted in recent weeks, my primary focus lately has been turning my weaknesses exposed at Wildlflower Long Course into strengths. Although the blowup I experienced caught me off guard, it wasn’t like I woke up that day and said – “ah, today’s a great day to post my worst race result to date”; for better or worse, it happened. 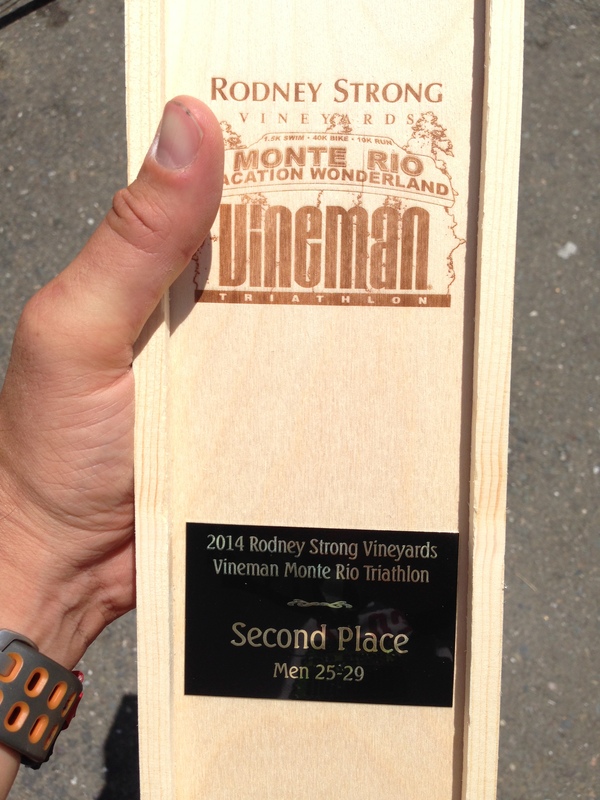 I refined my approach to training, made solid progress, registered for Vineman Monte Rio as a tune up race, and set realistic goals for myself; I’m pleased to say that I crushed it beyond expectations. I claimed my first podium at a large race (600 people) this weekend – 2nd in M25-29, and narrowly missed out on first place by 40 seconds. It was a true breakthrough moment in my athletic career. Even if I fall short achieving my remaining goals for this season or seasons to come, I finally experienced a race where I did my best from start to finish. I will write a more detailed race recap this week, but wanted to share the good news while it’s still fresh. Thank you all for your kind words of encouragement leading up to the race – train well! Great job!! Way to race!!! Congratulations! What an amazing race! Wow!! Congrats to you–that’s amazing!!! Great race!! Congrats on putting all the pieces together!! I knew you would hit all those goals!! That should give you lots of confidence going into Vineman!